The information presented on this page was originally released on January 22, 2009. It may not be outdated, but please search our site for more current information. If you plan to quote or reference this information in a publication, please check with the Extension specialist or author before proceeding. A trendy new word used throughout the landscape design industry is “nesting,” and the outdoor fireplace certainly has become a focal point in new nests. While the phrase “feather your nest” may be for the birds, each of us has that opportunity as well. The nesting goal is to design and build an outdoor living space so well that people hate to leave home. It is a personal corner of paradise and is ideal for gathering friends and family. 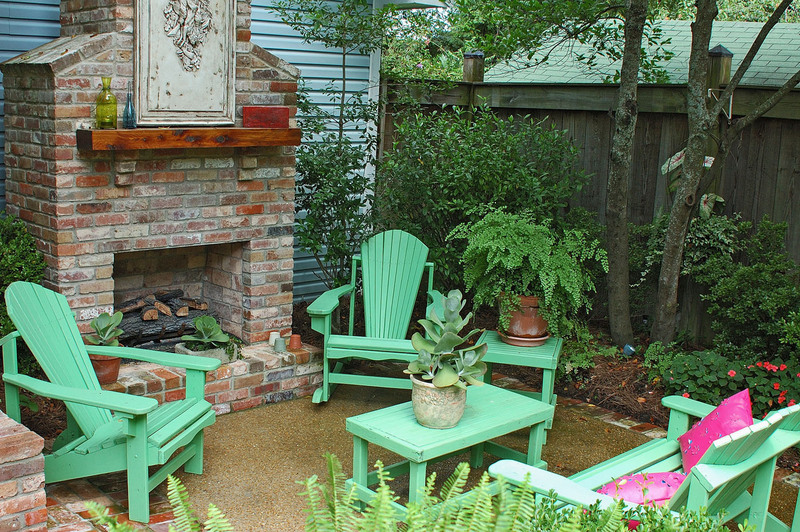 The outdoor fireplace is the feature that can tie it all together. When it feels like 40 below outside, a fireplace won't help much, but consider fireplaces as season-extenders. They let people get outdoors a little earlier and stay a little later. Arctic fronts rarely last for days on end, so a fireplace can be used throughout the cool season. There are many options for outdoor fires, from chimineas, which are the least expensive, to fire pits that can be portable or installed. Fireplaces also vary in cost. They can be built from kits, fabricated off-site and moved in, or the elaborate and constructed on site. Rest assured, if your family loves to gather around the fireplace inside, you will enjoy it even more outside. Before you start shopping, there are some key considerations. The most important involves zoning. You must find out the rules and regulations for building such a structure in your city and also in your neighborhood. Unless the regulations specify otherwise, outdoor fireplaces are just like indoor ones. You will have a choice of burning wood or using gas logs. I am noticing a shift toward gas, but it may just be a coincidence. This would certainly be the less stressful choice if you have neighbors who tend to complain about smoke from the grill. Smoke is definitely something you want to consider. Inside, it's relatively simple to send the smoke up the chimney. Outside, even a slight breeze can create a downdraft, forcing smoke out the front. However, professional contractors who know about chimneys and flues will know how to reduce smoke by creating a smoke shelf. As I travel around photographing and viewing landscapes, I notice that the trend today is to construct the custom fireplaces so that they look like an extension of the home exterior. This is accomplished using similar colors of concrete, brick and stucco-like smear, if warranted. The fireplaces are complete with hearth and mantle. Just like you place furniture around the fireplace inside, you will want to have room for something similar outside. Don't forget about walkways, not only to the fireplace but around your furniture, too. It is the greenery from the garden that creates the real ambiance and adds a cozy feel for the family. Remember, you want to feel like you are outdoors. Nesting is for the birds and for you, too. A good place to start is by creating an outdoor living room complete with the warmth of a fire in a custom fireplace.